Use compressed air and acetone on a cloth to assure that metal chips are removed from the top surface.The table is where the raw material will be held by a fixture or vise and must be clear of metal chips from previous jobs and any debris buildup. 2.Set up the fixture or vise. Place vises or fixtures as close to the spindle home position as possible.The milling table has slots to place T-bolts to secure vises and other work-holding fixtures.This will save time as the spindle will not have to travel far to start the cutting process.If the machine must cycle through 12 tools, time is wasted, which increases the overall cost per part. Place similar tools in close proximity to each other and make sure that if there are operations that use the same tool, place them together as well. 3.Tram the fixture or vise. Tramming a fixture or vise is the process of assuring that the holder is perfectly straight. Use a dial indicator across a flat surface to make sure that it is dead straight within 0.001 inch. Tap on whichever side is off until the indicator reads straight and tighten the fixture or vise down on the table. Re-check with the indicator and loosen if it has moved and restart the process until it is straight after being tightened. 4.Place the tools in the tool holder or spindle. 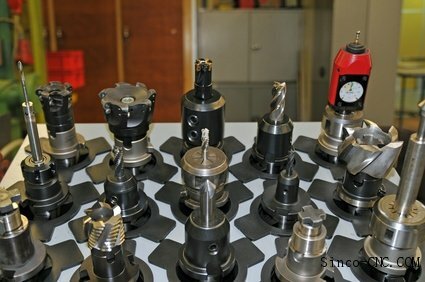 Use a drill chuck for drills whenever possible and make sure you use tools that are sharp, as that will allow you to keep your dimension close to the print.The spindle will bring the tool to a probe to measure its distance from the top of the table for accurate cutting. You must manually enter the other tool information, mostly its diameter. Peck drilled holes with high rapids. Rapids are the speeds at which a drill returns to its operation, either between tool changes or during the drill pecking process. This will save time and prevent chip buildup that can lead to drill breaks. Use a center drill when drilling with a drill bit but refrain from that extra step if using a center-cutting end mill for any drilling operations. Leave a center drill in one of the open slots to save time when setting the tools as they can often be of any sized tip.